Linda’s work with Pine Tree Society began in the 1980s when she joined the Pine Tree Camp team as a camp counselor. Little did she know, that was just the start of her impact on Maine people with disabilities and their families. 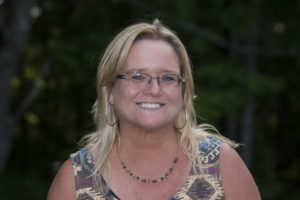 Linda joined the Pine Tree Society team as a speech language pathologist in 1996 and in 2005 was named the director of the organization’s speech language and Assistive Technology program. Linda is known for her contagious energy, enthusiasm and an unparalleled commitment to the people she serves. Her background is primarily in working with individuals with profound cognitive and physical challenges as well as those with Autistic Spectrum Disorders. She also works extensively with high-tech Augmentative and Alternative Communication (AAC) users both in programming and training the student and their team members in their device use. Linda has earned the credential of Assistive Technology Practitioner by passing an examination administered by the Rehabilitation Engineering and Assistive Technology Society of North America (RESNA).